The Miracle at Verdun I have come to feel, all in all, is the most valuable play telling about contempt. I think the meaning of contempt--its full meaning--is the most valuable information the world needs to know.... This play makes... the knowledge of it clearer and greater. There are two kinds of contempt: (he continued) the kind you can see immediately accompanied with... a sneer of the lips, and then the contempt which is very quiet. Hans Chlumberg, who lived from 1897 to 1930, Mr. Siegel said, "represents a big feeling in Germany [and Europe], which gave rise to expressionism; it is very much in this play." 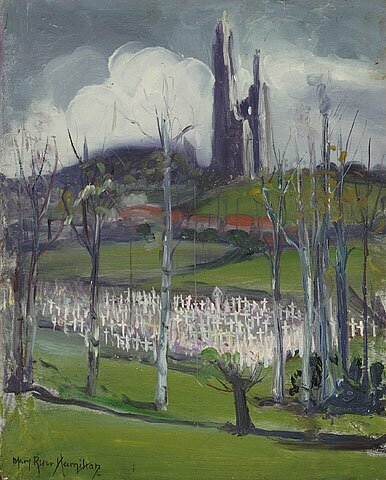 When The Miracle at Verdun was put on in 1931 by the Theater Guild in New York, it failed, yet in Europe it made a “profound impression.” "The feeling after the First World War that people had," Mr. Siegel commented "didn't take the form that [the war] was caused by contempt, but there is enough [here] that you can see it." Contempt, he has defined as "the addition to self through the lessening of something else." One should put oneself in Germany in 1918 with Hitler coming to be about 12-14 years later and [think about] what was felt. Verdun was seen as the most costly battle in the history of the world... 2 million took part, 700,000 died... Stalingrad [the turning point of World War II, which occurred in 1941] at least had a decision. Verdun never had a decision. He fought bravely, bearing part in the battle of the Isonzo, but was shocked by the scenes of carnage he witnessed and impressed by the madness and futility of it all... Chlumberg hop[ed] that the reign of might would soon be succeeded by the reign of right, and that the ideals of peace and brotherhood which he had always cherished would prevail. What if the soldiers who fell in the War were to rise from their graves and return to the world they had died to redeem? Would that world really want or welcome them: Would they find it any the better for their sacrifice, or the more determined to prevent such a catastrophe in the future? I respect Hans Chlumberg enormously for the questions he was dealing with in this play. How urgent they are now. Mr. Siegel said: "I don't know of a play that can make contempt more seeable, more something that has affected people not just some of the time but all of the time." Listening to this play with its courageous descriptions of contempt, I felt even more the necessity of strict self-criticism. There are eight scenes, and Mr. Siegel read the first three. He gave this brief description of the plot: "Some of the soldiers, both French and German, arise from a mass grave, but their return makes for too much of a disturbance in the world, so they go back to their graves." VERNIER [disabled cemetery attendant who wears a military cap] [grumbling]. What the devil!... Who is it?... Don't you know when we close up? No more visitors today! TOURISTS [out of sight] What's that? What's he saying? No more visitors? Why not? What do you mean? Open! Open up!... We paid our money! Commented Mr. Siegel, "Having the grave and all this human irritation is already dramatic. Something like this [likely] occurred today with persons visiting the graves at Gettysburg." There is a sense here of something both serious and everyday. The scene continues and we can ask: Is there contempt here? JACKSON (an American) [making notes] Wait a minute. How many were killed? VERNIER. The exact number isn't known, sir... I should say about ten thousand... Or even fifteen thousand, perhaps! But anyway, the losses were very great, sir. JACKSON [making notes]. Ten thousand, fifteen thousand. So. [Pause.] Now last year we were in Flanders and they showed us battlefields where four hundred thousand were killed! Six hundred thousand! In a single year! JACKSON. Wait a minute. How many graves do you have...? VERNIER. About two thousand, sir. JACKSON. ...Well I'll be damned. Ten thousand killed and two thousand graves — but it costs us two hundred French francs to see them. Commenting on World War I, Mr. Siegel noted, "Americans didn't see how much Europe suffered. "Of course America suffered somewhat herself but not the way Europe did." As the dialog goes on, contempt is building: the Americans and English have it for the French, the French for the English and Americans — all this going on in a cemetery with persons visiting, seemingly, to honor soldiers lost in battle. MISS GREELEY. [an English woman] ...there was one cemetery that had twenty thousand graves of unknown German soldiers, and they gave us lunch and dinner... Well, that's France for you! France! LARAT. Who the Devil sent for you? Why don't you stay home and visit your own battlefields, if you don't like ours! SHARPE [Englishman... with appearance of great dignity] These are our battlefields, gentlemen. JACKSON. Yes! If we hadn't bled for you, you would have been lost! FRENCH [with an angry laugh]. You — bled for us? You — ? REMUSAT. You bled for your business!... You entered the war after your ships were sunk, and, of course, you didn't care about your war credits, your war profits? Shortly after this exchange we are deeply moved as Vernier explains that the French and German trenches "ran parallel to each other and hardly more than 100 meters apart" and here in a mass grave they "lie side by side." MISS GREELEY [indignant]. ...Why, they were enemies! VERNIER. ...That was only in the beginning, I believe. But then ...we lay... they lay so close together in the same trench. They were being fired at from both sides. They had to press close together for protection. The same shells killed or wounded them. They had to bind one another's wounds, share their drinking water, their provisions, their cigarettes, their gas masks.... [In the end]... Neither army wanted to leave the trench in possession of the enemy, so they blew it to pieces from behind the lines. Vernier mentions that the next day there will be ceremonies commemorating the soldiers, and "divine services" and prayers for the dead. Government delegates will be visiting and speeches will be given. A German tourist asked "What do they want, for those fellows down there...? What will they ask for, in their prayers...? VERNIER. You ask strange questions, sir... For the peace of their souls, I suppose. For their comfort...[Pause.] And most of all, for their glorious resurrection! That especially, I should imagine! I'm reading this so the cause can be tested. This play is all about contempt — with the living having contempt for the dead, and the dead for the living. At the same time contempt as a universal presence is not seen. I think Chlumberg couldn't have said that the purpose of the "mad pestilence" was to get to the quietude of contempt. There wasn't a feeling that a quiet thing like contempt, which everyone enjoys, could be the cause of the Somme and Verdun. It is a momentous fact of the 20th century, that Eli Siegel described what contempt is and showed it to be not only the cause of domestic pain and cruelty, the cause of mental weakening, insanity, but also the cause of war. That this explanation is not known worldwide even now, as horrors are taking place, is for one reason: the press and media out of conceit have kept the knowledge of Aesthetic Realism from reaching people. What's in this one lecture should be on the front pages of newspapers tomorrow! WEBER. Are you shivering... Brother? HESSEL [gets up with an effort, listens, in tense rapture. Then he whispers, his eyes large with wonder] Kameraden! Do you hear — I hear — the wind! BAILLARD. I hear leaves rustling. It must be blowing — through trees? MOREL. The light — over there!... Look — the light! [Comprehending.] I'm not blind — any more! No, you didn't wake me! Why, I don't sleep here!... I'm sitting at the... desk and working. Quite right, my friend. Yes, work is our only salvation.... That's right. Our country comes first. No, the public has no idea.... So! Monsieur Leblanc--... I must say you astonish me. "The dead have risen!" Well, I'm not stupid: The press has made unfavorable comments on my speech to-day... But I can justify every word I said! Tell your friends that, M. Leblanc! And you can also tell them from me that they don't have to raise the dead from their graves to get my resignation! In France, you say? Well, that's fine. Let them have a little trouble too... God knows they have it coming to them. But... what can we do about it? You have the wrong department! Whom should you call?... The Papal Nuntius? The Archbishop? Or even the Chief Rabbi, for all I care! But not the Chancellor of the Reich! He has nothing to do with the dead! He has a hard enough time with the living! It isn't worth talking about, Father. Don't let it interfere with your sleep. Something about France and the dead. It can wait till tomorrow. And the Prime Minister of England, Lord Grathford, meets this astonishing news with complacent, cold indifference. The next war has to be against ugliness in self. And the greatest ugliness in self is the seeing of contempt as personal achievement. Contempt must be had for contempt before squabbles grow less, terror diminishes. Respect for what is real must be seen as the great success of man. If you want to visit Lynette Abel's homepage, please click here. Or, if you want to comment on this and send Lynette Abel an e-mail, please click here. More on Eli Siegel's Lectures here.